Today, the progenitors of Type Ia Supernovae (SNe) and their lower-luminosity thermonuclear cousins remain shrouded in mystery. While researchers agree that these SNe mark the explosions of white dwarf stars, it is unclear what destabilizes the white dwarf: merger with another white dwarf, accretion from a H-rich main sequence or giant star, or perhaps interaction with a helium star? Deep radio observations with the VLA can tackle this puzzle by searching for material in the environments of SNe, left over from the process of mass transfer onto the white dwarf. When a SN shock interacts with surrounding material, relativistic electrons are accelerated and magnetic fields are amplified, yielding synchrotron emission. Therefore, radio observations of SNe provide insight into pre-SN mass loss and SN progenitors. In a paper recently submitted to Astrophysical Journal, our team combined archival radio observations from 30 years of legacy VLA operations with new observations from the Karl G. Jansky VLA. This yields a sample of 85 thermonuclear SNe observed by the VLA in the first year following explosion. None are detected. These radio limits imply that Type Ia supernovae explode in low-density environments. We use our limits on the density of material surrounding these SNe to constrain the fraction of thermonuclear SNe that might have red giant companions. We make use of legacy VLA observations of Galactic symbiotic binaries carried out by E. Seaquist and collaborators to characterize the density of material around white dwarfs with red giant companions, and find that, for many SNe, we can rule out such symbiotic progenitors. 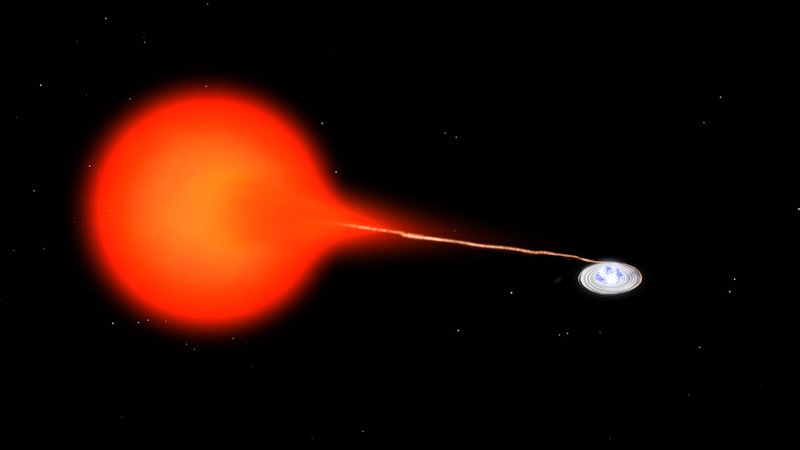 We conclude that ≲10% of thermonuclear SNe have red giant companions. Future work with the VLA can improve upon these results via: (a) further observations of Galactic symbiotic binaries that more completely pin down their wind properties; (b) additional observations of a large number of Type Ia SNe, providing even stronger constraints on the fraction with red giant companion; and (c) analysis of radio observations at longer times after explosion (1-100 years, as the SN transitions to a SN remnant) to probe the SN environment at larger radii. The NRAO operates a complementary, state-of-the-art suite of radio telescope facilities for use by the scientific community, regardless of institutional or national affiliation: the Very Large Array (VLA), the Robert C. Byrd Green Bank Telescope (GBT), and the Very Long Baseline Array (VLBA)*. The NRAO is building two new major research facilities in partnership with the international community that will soon open new scientific frontiers: the Atacama Large Millimeter/submillimeter Array (ALMA), and the Expanded Very Large Array (EVLA). Access to ALMA observing time by the North American astronomical community will be through the North American ALMA Science Center (NAASC).